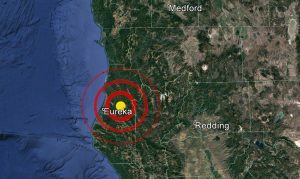 EUREKA, Calif. – A small earthquake was recorded 20 miles east of Eureka, California. The preliminary magnitude 4.4 quake occurred at a depth of about 14 miles at 10:23 a.m. on February 6. There were no tsunami warnings, advisories, watches, or threats issued. The latest earthquake follows a swarm of temblors that struck the same area in less than 24 hours over the weekend. More than 240 people reported feeling one of those quakes, according to The San Francisco Gate. So far, there have been no reported injuries or substantial damage to any infrastructure.